The IPv6 Test Lab bundles SQC’s competencies in the area of IPv6 testing and offers a wide range of services to potential partners. In the context of various international projects, SQC has developed several test suits in the area of IPv6-Testing. Fraunhofer FOKUS has also built the IPv6 test bed for executing various tests as well as product evaluation. Furthermore, SQC delegated several experts to ETSI (European Telecommunications Standards Institute) for the development of IPv6 test suits. 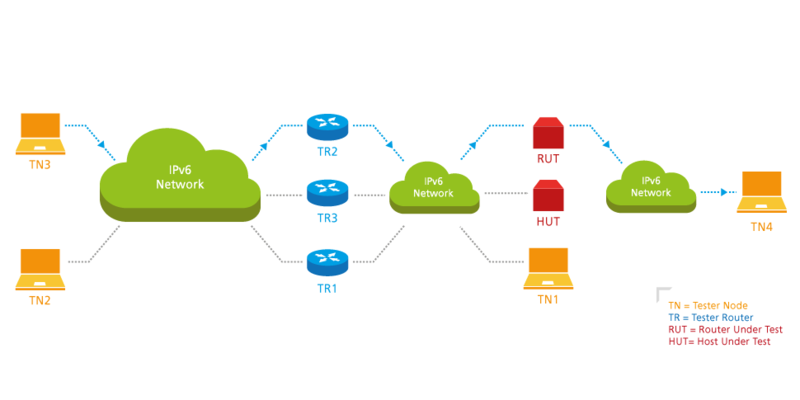 Communication networks are on the path towards all IP network infrastructures, which allows the provisioning of NGN (Next Generation Network) telecom networks and multiservice (i.e. voice, data, video etc.) Future Internet type of networks. In the course of this process, IP plays the role of gluing together the transport layer and the underlying link and physical layer technologies, such as Ethernet, SDH, Frame Relay, etc. Clearly, IPv6 constitutes the set of latest advances in IP research and development, which have also successfully passed the process of standardization at IETF.